Home» TS LATEST UPDATES » TS Gurukulam Tribal Welfare Residential Society Intermediate Admission into First Year with Integrated coaching for JEE/EAMCET 2016-17. TS Gurukulam Tribal Welfare Residential Society Intermediate Admission into First Year with Integrated coaching for JEE/EAMCET 2016-17. TS R.C.NO:1864, Gurukulam Tribal Welfare Residential Society Intermediate Admission into First Year with Integrated coaching for JEE/EAMCET 2016-17. TS RC.NO:1864, GURUKULAM (Telanagana Tribal Welfare Residential Educational Institutions Society) COMMON ENTRANCE TEST FOR ADMISSION INTO 1st YEAR INTERMEDIATE WITH INTEGRATED COACHING FOR JEE Main/Advanced, EAMCET FOR THE YEAR 2016-17 FOR (01) SOE, (02) COEs &(01) IIT STUDY CENTRE, HYDERABAD. Center apart from other RJCs for ST Students to provide necessary academic environment and inputs and also providing specialized coaching to meritorious ST students to enable them to compete successfully in order to get admissions into All India Level Institutes such as IIT, NIT, IIIT, ISER,NISER& Medical Colleges etc. The selections will be made on merit basis through Screening Test at two levels conducted by TS Gurukulam. The 1st Screening test will be objective type and 2nd Screening test will be descriptive type. Only the meritorious students from the 1st screening test will be permitted to attend 2nd level screening test. After the 2nd level screening test the selected students will get admission into 1st year Intermediate with integrated coaching for JEE Main/Advanced, EAMCET along with all benefits which extended by TS Gurukulam such as free boarding, lodging, Uniform, note books & text books, bedding material and examination fee etc. I. Applications are invited from Boys & Girls of Scheduled Tribes of Telangana State for admissions into 1st Year Intermediate in English Medium for MPC & Bi.P.C Groups for the Academic Year 2016-17 in the following institutions functioning under TSGurukulam. through the Entrance Test and in case of SOE,Khammam the left over seats (after filling with the passed out 10th class students from the respective institution) only will be filled through the entrance test. have secured at least B2 grade(7 points) in aggregate and also secure B2 grade in English in SSC Public Examination 2016. Income, Ration card, Aadhaar card, Marks Memo, Study, T.C; Physical fitness certificates, 06 Passport size photos at the time of admission. www.tgtwgurukulam.telangana.gov.in. There is no registration fee for submission of application through ONLINE. 1. 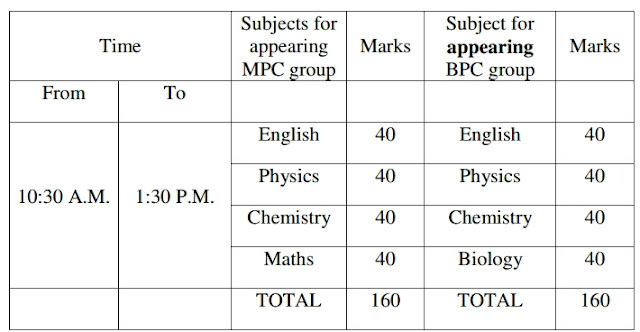 The Screening test will be conducted at two levels, 1st Screening test will be objective type and 2nd Screening test will be descriptive type with the following subjects for MPC and BiPC groups separately. 3. Selections will be made on the merit basis subject to fulfillment of ‘Eligibility’ and ’Reservation. 2. Selected students will get all benefits extended by TW Department such as free boarding, lodging, dresses, books, Medical care and Examination Fee etc., Medium of Instruction : English will be the Medium of Instruction. x. For any clarification & additional information in this regard, contact the District Coordinating Officers with following cell Numbers. Get Here on line Registration Click Here.